Happy days are here—still—at New Mexico’s vintage drive-ins, diners, and cafés. In much of our country, Main Street cafés and drive-ins with carhops have gone the way of Fred Flintstone’s bronto burger. But New Mexico still boasts a wealth of vintage, family-owned and -operated restaurants. To celebrate these classics, last year the New Mexico Tourism Department launched the Culinary Treasures Trail (newmexico.org/culinary), which features some 80 independent, family-owned dining establishments at least four decades old. Whether you’re ravenous for rellenos, hungry for hash browns, or crave a plate of carne adovada, there’s a gem of a place for everyone in every corner of the state. Have taste buds, will travel. Dimetrios Papadomanolakis made his way through Ellis Island in 1912 with a $20 gold piece and high hopes for making this land his home. He changed his name to Jim Pappas and headed west, to toil in the coal mines of northern New Mexico. Then, with his savings, he bought some 500 goats and started a cheese business. It was the Prohibition era, and there’s some speculation among family members that Jim made some extra money selling moonshine. In 1923, Jim founded the Pappas Sweet Shop, which began as a candy shop but soon grew to offer ice cream, and later, a full restaurant experience. Jim ran the business until his son Mike took over in 1958. Mike still operates the restaurant, with the help of newer generations of the family. Hundreds of collectibles are on display at the Sweet Shop, many related to the original manufacture of candy and ice cream. The restaurant dishes up carefully made sandwiches, soups, and salads at lunch, and the most popular dish on the dinner menu is the choice Angus steak. Back in the 1950s, when A. C. Bryant launched his drive-in, he kept it open till the wee hours of the morning. Young musicians recording at Norman Petty’s nearby studio refueled at the Foxy after they’d finished for the night. The Lubbock kid with the Coke-bottle glasses, hoping to catch his big break, was Buddy Holly, and yes, the rest is music history. Along with Buddy and his band, the Crickets, Ratón’s Fireballs were frequent diners here in that nascent era of rock’n’roll.Fortunately, not much has changed at the Foxy since Buddy’s day. A working general store since the end of the 19th century, Bode’s took its name from Martin Bode, a German immigrant, who stopped by one day looking for a little work and, by 1919, owned the place. His son, Karl, took over after returning from the Korean War. Current owner Dennis Liddy visited Bode’s with his wife, Constance, on a whim in 1993. He wanted to get out of real estate development in Santa Fe, and he offered on the spot to buy Bode’s just as Karl was wondering how and when he was going to retire. You can still get blue-speckled enamelware and a bag of nails, along with a piquant tamale or one of the state’s best green-chile cheeseburgers. On family vacations when I was a kid, I loved looking out our station wagon’s windows and spying a restaurant with a big ol’ steer on top. I don’t ever remember my parents stopping at one, but I sure thought those cows were cool. No doubt Del’s was one of those spots—we often traveled Route 66. One of the most compelling reasons to stop at Del’s is that the second generation of the family to own it, sisters Yvonne Brasil and Yvette Peacock, shared 2011’s New Mexico Restaurateur of the Year award. These two dynamos offer a warmwelcome, consistent quality, and attention to details that matter. By far, their customers’ favorite dish is the crackling-crisp chicken-fried steak, but their chile-smothered burritos get raves too. Though known today for distinctive New Mexican dishes (particularly chiles rellenos, rolled enchiladas, carne adovada, and stuffed sopaipillas), Pete’s served no local fare in its first 20 years of business. Pete and Eligia Torres founded their café just after World War II, across from the Atchison, Topeka & Santa Fe Railway line, in the heyday of railroad travel. In that era, trains would stop in towns long enough for passengers and crew to get off and have a bite, and these travelers expected familiar food, not dishes anointed with our red and green. Gradually, demand increased for Eligia’s home specialties, which today make up most of the menu. After Pete and Eligia passed on, several other family members became joint owners. Daughter Theresa now manages it with the hospitable spirit she learned from her parents. Pete’s Café, 105 N. First St. The Liddys, who own Bode’s General Store, smile and say there’s nothing fancy about this salad—but their customers can’t get enough of it. It’s not as hard to make the tortilla bowls for the salad as you might think, and they look quite festive. In Dutch oven or other large, heavy pan, warm at least 3 inches of oil to 365° F. (If cooking at 7,000 feet or higher, heat oil to 355° F.) Have soup ladle handy. Place 1 tortilla in oil and let cook 5 seconds. Immediately, press down center of tortilla with ladle to form base of bowl. Keeping ladle in place, continue to fry tortilla 1 to 2 minutes, until it has crisped and turned slightly golden. Drain tortilla bowls on paper towels. Brown ground beef and onion in heavy skillet over medium heat. Drain off all but about 1 tablespoon of fat. Stir in salsa, dried red chile, and salt, and simmer over medium heat about 10 minutes, stirring occasionally. 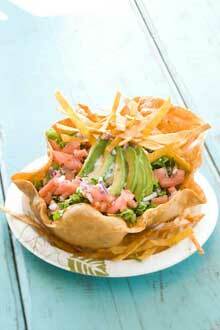 Just before serving, arrange each tortilla bowl on a plate. Divide lettuce equally among bowls. Spoon warm meat mixture equally over lettuce, then add equal portions of beans, cheese, and additional toppings to taste. Serve immediately. 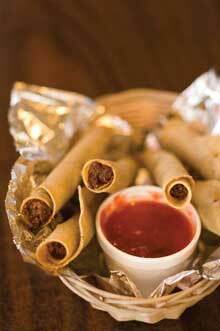 Anyone who’s spent much time around Clovis and Portales knows that there, taquitas is never spelled taquitos, as the common spelling elsewhere, and they’re most certainly never called flautas. Toss chicken together with garlic and add salt, if needed, to taste. Pour 1½ inches oil into deep skillet or heavy saucepan. Heat until oil ripples. With tongs, dunk a tortilla into hot oil long enough for it to go limp—a matter of seconds. Don’t let tortilla turn crisp. Repeat with remaining tortillas, and drain by placing them between paper towels. Spoon about 2 tablespoons of filling on each tortilla, roll up tight, and secure with toothpick. Reheat oil to 375° F. (If cooking at 7,000 feet or higher, heat oil to 365° F.) Add several taquitas to oil and fry about 2 minutes, turning as needed to cook evenly golden brown and crisp. Drain. Repeat with remaining taquitas. Remove toothpicks and serve immediately, with salsa. Traditional natillas are a creamy custard lightened with beaten egg whites, in the style of “floating island” desserts. This version comes from the family of Pete and Eligia Torres, founders of Pete’s Café, in Belén. Return saucepan to medium heat and bring custard gradually to a boil again, stirring frequently. Simmer 8 to 10 minutes, until custard is thick enough to moderately coat spoon. Remove from heat and stir in vanilla. Custard can be served warm, or refrigerated for up to several hours, which will thicken it a bit. Before serving, beat egg whites and remaining ¼ cup sugar with electric mixer until peaks form. Fold egg-white mixture into custard and serve.